Why do we care about e-books versus “real” books? “Tree*” books, “real” books or just plain “books” as they’re often called have been around for 5,000 +/- years and now i swear there are more “ebooks vs books” writings than curls on my head. Why is that? Why does anyone care what format our stories, facts, conversations, and fun come in? Why are we so worried that tree books might be going away? Is it because they are “tradition”? Is it because “books” are what libraries are known for and if they go away, we think we’ll disappear too? I would like to take this moment to remind you that it isn’t the technology that is important but rather the information it is sharing or the problem it is solving. True, a book is very old “technology”, but that’s what it is- it is just another casing through which ideas, stories, facts, conversations, teachings, are shared. And it’s not the method of transmission that’s important- which is only as good as it’s content. Sure, perhaps you like the feel or smell of the book and it’s pages over a device- but don’t you like the story or knowledge ultimately more? Sure, i might be upset if the next generation doesn’t know what it feels like to read a paperback on the beach- sand between the pages and all- but i’m sure my mom isn’t distraught that i have no idea what an 8 track feels like or sounds like. Perhaps you argue that we’ll be leaving people behind because not everyone will be able to afford an e-reader- well, you’re right. But I’d like to remind you that no matter how fast things seem to go- a 5000 year old technology is going to take a little more time than overnight to disappear- if it ever does. We will always have books- even if they’re in the archives and 100 years old instead of the library for circulation. If the world’s new normal are reading devices that aren’t today’s “book”, libraries will just change their model and loan e-readers. Because in a world of e-readers and no printed materials, e-readers are cheap like books and we wouldn’t care if they’re lost, stolen, or smeared with jelly. That’s the point, though, isn’t it?- libraries provide ACCESS and COMMUNITY to those who want it. And neither of those things, along with learning, are dependent on a technology, a medium, or a casing. Yes, the hundred-year stereotype of the library is “book”- but that’s just because a book was the primary source of entertainment and education for so, so long. If our current and modern conception of a “book” truly does go away, i’m not worried- I know that society will still thrive on the transmission, creation, and sharing of ideas, facts, stories, and more. And Libraries will always have a place in that world. Bold Prediction: Why e-books will never replace real books. Jan Swafford, Slate. 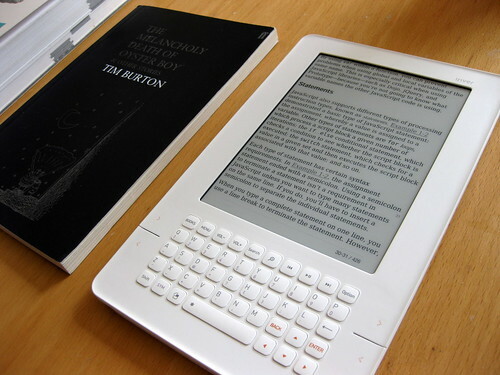 Buyers of E-Books Still Like Print Too, Survey Shows. Jennifer Valentino-DeVries, Wall Street Journal. Will E-Books Really Destroy Libraries?. Charlotte Abbott, Follow the Reader.